When compared to most of the rest of the Stephen King canon, Rage is a strange case for a few reasons. It was the first novel published under the name Richard Bachman, a pseudonym King took on early in his career to prevent market saturation. The novels written under the Bachman name were leaner and meaner, focusing on real life horrors instead of ghosts or vampires -- things King was writing about under his own name at the time. 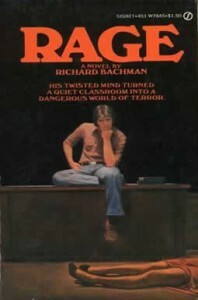 The Bachman books tend to have a grittier and nastier tone than the folksiness Steve King was becoming famous for, and none of them are nastier or more chilling than Rage. Another reason this book is so strange is it is the only book written by King to be taken out of print. This guy has published 60-something novels, and this is the only one you cannot find on store shelves or -- usually -- online. If you do luck into finding a copy on eBay or Amazon, it'll definitely set you back a pretty penny or two. It can be found in the old collection The Bachman Books, but even that collection can be pretty hard to find due to the old version with Rage in it also being taken out of print. Why is it out of print? you may ask. Okay, okay -- you're probably not asking that. It's a pretty well-documented fact that copies of Rage were found in the lockers of several school shooters back in the '90s, and King himself asked that it be taken off shelves -- he didn't want the book to act as an accelerate of violence. Admirable decision, but I'm not sure a school shooting is the focus of the book. Sure, Charlie Decker -- a very troubled high school senior -- brings a gun to school, kills two teachers, and holds his classmates hostage.... but that's basically it as far as the killing goes. It's over with pretty quickly. The rest of the book is sort of a Breakfast Club from Hell, with Charlie and the other students sharing stories from their childhood and finding tenuous connections with one another. So.... yeah, I guess I can see why Stephen King would allow this book to fall out of print, but it's really a shame -- most of his casual readers will probably never get to experience this story unless they happen to stumble across The Bachman Books. And, finally, this book is strange for the fact that I'd only read it once before this reread, and that initial read was several years ago. I've read most King novels at least three times, but this one.... I just never had the urge to reread it. I didn't hate it at the time, but I was relatively new to the King fandom and I wasn't struck by Rage quite as much as I was by, say, Christine or Under the Dome. I just thought of it as a quiet, angry little book written by a very young man -- the first draft of Rage (originally titled Getting It On) was written when Stephen King was only a senior in high school, after all. I still think of it as an angry novel that was -- rather obviously -- written by a man just starting out in his writing career. The pacing is weak in spots; the dialogue is off, especially the girls'. The students ganging up on Ted Jones (the most popular boy in the class and Charlie's foil) is...unbelievable, to put it nicely. The book is entirely first-person, which is fine -- this is the first time King did that, and he pulls it off. However, Decker goes into unwieldy Freudian rants at times that don't strengthen his character -- as King probably intended -- but instead weakens the novel as a whole. It's obvious SK had some big ideas when working on this novel, and he definitely had a lot to say about bullying and growing up, but the lengthy spiels come off as sweaty and unfocused, not nuanced or fitting of everything else we know about Decker up until then (which isn't a whole lot, admittedly). Written in the late '60s and edited/published in the '70s, King says a lot of things here that he simply could not get away with in 2015. This book is very much a product of its time, but that's okay -- it's neat (and rather chilling) to see the thoughts on school shootings and bullying from a man in the '70s, a time when school shootings were a very rare occurrence. Only twenty years later, shootings would, sadly, become much more regular and troubled students like Charlie Decker would try crazy stunts. Rage is a book worth reading at least once, if only to see King's progression as a writer. This is a raw book, but it has an ax to grind and is not afraid to do so. It's chilling, especially when read through 2015 eyes. At times unbelievable and amateurish, its flaws do not eclipse the well-meaning nature at its core -- we must reach out to those around us and try to understand. We need each other. "When you're five and hurt, you make a big noise unto the world. At ten you whimper. But by the time you make fifteen you begin to eat the poisoned apples that grow on your inner tree of pain. It's the Western Way of Enlightenment." Decker calling roll after gunning the teacher down.... such a chilling and, oddly enough, funny scene. I laugh every time. Next would be Night Shift, but I just reread that in February and don't feel like reading it again so soon. Maybe I'll catch it later. My next Stephen King reread will be The Stand!